April is celebrated as the International Caesarean awareness month. Do we have a normal delivery awareness month being celebrated? No. Why? Because it is considered to be normal and an accepted way of birthing. 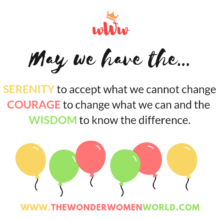 Why do we have to create awareness about Caesarean section? I will tell you why. It is not considered to be “normal”. It is, as some people call it “the easy way out” and a painless option for lazy moms who do not want to go through the labour process. 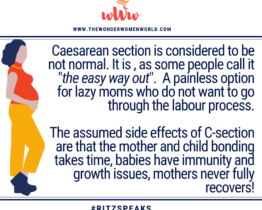 The “assumed” side effects of C-section are that the mother-child bonding takes time, babies have immunity and growth issues, mom never recovers fully! want to have normal delivery, and it so happened that in the ninth month I developed high blood pressure and despite inducing labour ultimately, I had t o undergo a C-section for both our safety. When I heard my baby cry for the first time, I felt so relaxed. When you are on the verge of delivery the only thing that matters is the safety of the baby and the mother, nothing else, absolutely nothing else. I don’t really understand the stigma attached with C-section. Having two C-section babies, I was not guilty even for a second. My babies and I were happy and healthy. Bonding between my kids and me was from the day I conceived them. My kids have grown up healthy and have great immunity. Ultimately delivery, by any method, involves pain. C-section is a major surgery and like any other surgery recuperation is important. So, people who say it’s the easier way out are really, really ignorant. A mother no matter how she gives birth is a mother period. It’s high time people shun the myths and stigma associated with C-section. It’s really unfortunate that we have to dedicate a month to celebrate and create awareness about Caesarean. Even educated people have so many preconceived negative notions about it. If you can’t help a new mother, then you don’t have the right to make her feel guilty about birthing. Help her heal the C-section scar, don’t add more scars to her confidence.